No running water, no parking and only four electrical outlets? 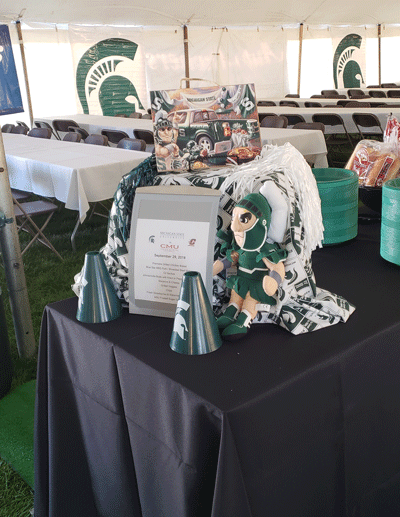 No problem for the Creative Dining Services team at Auto-Owners Insurance, a Lansing, Mich., company that loves to tailgate with the MSU Spartans. Plus: catering do’s and don’ts for any event. For eight years now, a giant tailgate party has gone off without a hitch for 1,000 employees of Auto-Owners Insurance. The marching band field at Michigan State University (MSU) is the location for the classic, fun, football-themed event. The Auto-Owners corporate office is a supporter of MSU, which includes a marketing agreement which allows Auto-Owners tent space and tickets to a game. The employees then invite guests from the opposing team. For example, at a Michigan State vs. Indiana University game, agents from Bloomington, Ind., are invited to the tailgate. While the sporty setting is perfect as an end result, the 18-person catering team has its work cut out for them each year: there’s no running water, parking is a bear, there are only four electrical outlets and there’s no equipment or tables already in place. Shockingly, there isn’t even any grass in place on the practice field! So, the Creative Dining team must roll out yards and yards of grass carpet to go between buffet tables and the eating area under a big tent. (Some Creative Dining associates from other accounts besides Auto-Owners come to help with the tailgate). The morning begins at 6 a.m., with catering staff Ubering to the field (the solution to the no parking problem). There are three parking passes, however, and those are shared between catering vans loaded up with kitchen equipment and food that’s kept at appropriate temperatures, hot or cold. With five fast hours of prep time, the grills get fired up first. That way, the slower cooking proteins—pork and beef—will get going. Then there’s the veggie sides, salads and specialty desserts (the Sparty sugar cookies have become a calling card of the event. 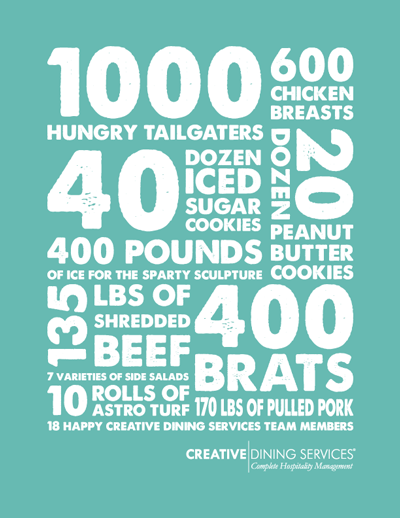 See graphic Catering by the Numbers). Each year, a new ice sculpture is created to mark the occasion. Past ice sculptures have included the State of Michigan, the Spartan Stadium with the Auto-Owners logo inside and most recently, a giant replica of MSU’s mascot, Sparty. Prior to the event, MSU’s dining department must inspect and approve the tailgate for food safety standards and practices. Do visit the site ahead of time. Check out the kitchen and prep areas. Check on timing for the set-up process as well as parking availability for loading and unloading. Some locations charge by the hour for every hour over the agreed-upon rental time, so this is essential. Don’t create a mismatched menu and serving style. Does the food support the theme of the event? If you’re doing a grazing station, avoid messy foods and instead offer easy-to-eat appetizers and finger foods. Consider passed appetizers to combat long lines at the buffet table. Consider a combination of served and self-served options. Do find out about your audience’s limitations. Are they nimble enough to easily maneuver around food stations, or would a plated menu be better suited for them? What are their dietary restrictions? Don’t assume everyone’s on the same page. Double-check all logistical details with outside vendors. Make sure all contracts and deposits are in order. Designate an onsite coordinator for handling last-minute questions and prep work. Who is your go-to person on the ground?